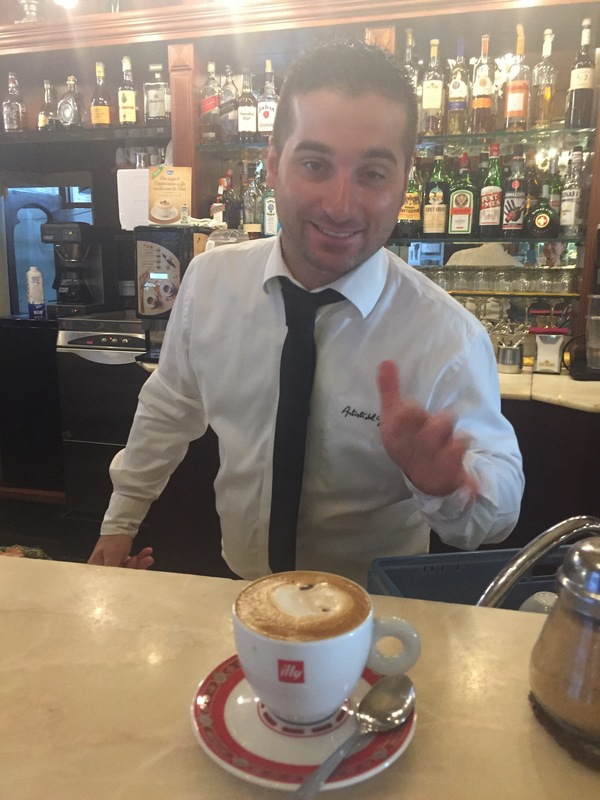 I have to say that I have found a whole new community of friends here at Il Sasso. Today we had Alberto in the morning, and Costanza told us in the afternoon that he thought we had done very well with the congiutivo. During the first pausa, Sara Czech, Henrietta, and I walked as fast as we could al mercato. It’s only on Thursdays, so as soon as I got my fiori di zuchine e pomidori, we had to rush back to the school. 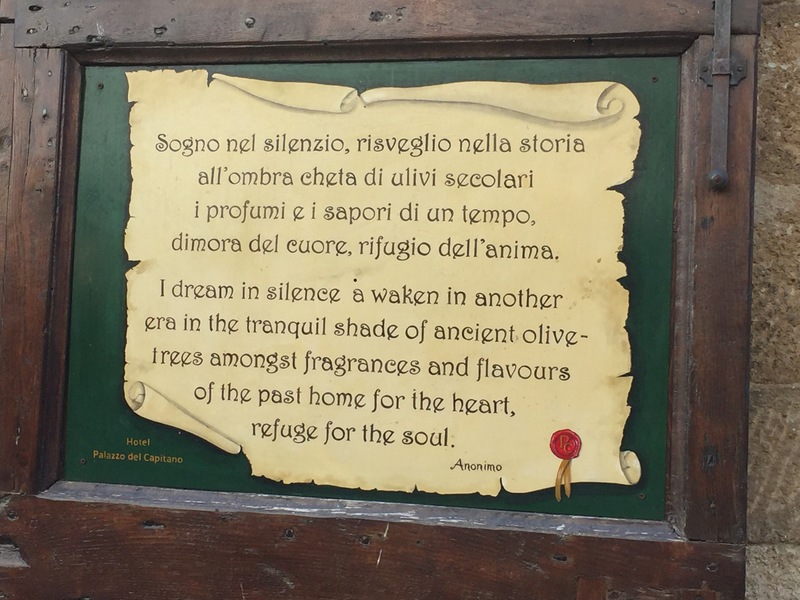 This afternoon we met at the school to go on an excursion to San Quirco and Bagno Vignoni. 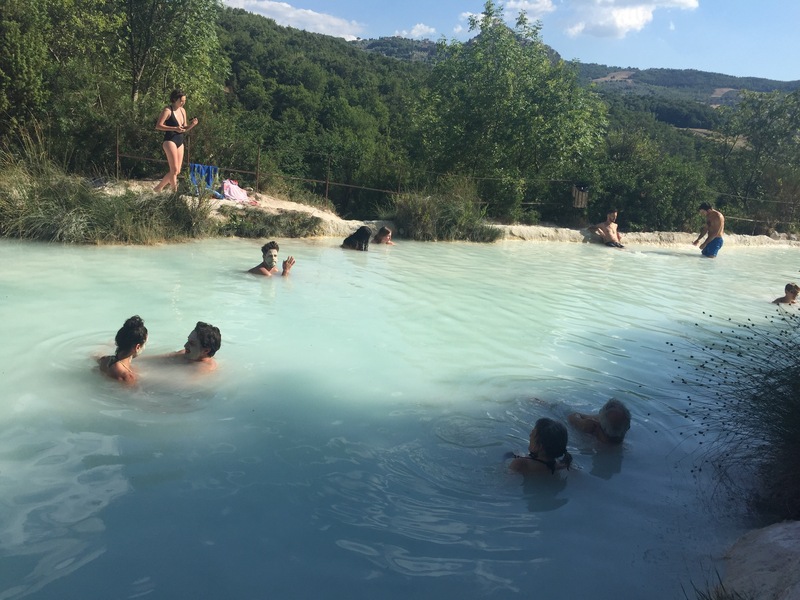 I’d been to San Quirico before with Kurt and Sandra, and I’d been to Bagno Vignoni twice before. San Quirico was very hot, and it was during the pausa, so it was very dead. Still, Sara, the teacher Sara (troppi Sara! 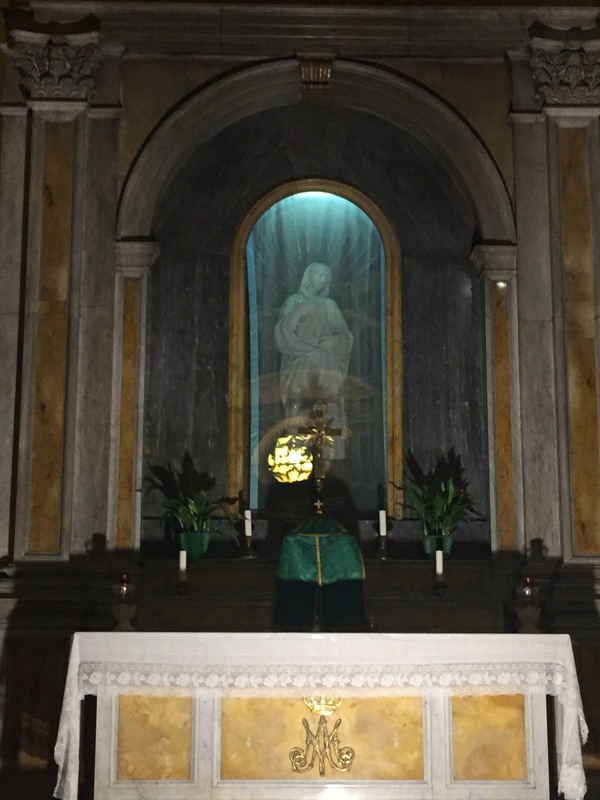 ), is an art history expert and led us through the town, two churches, and the park. 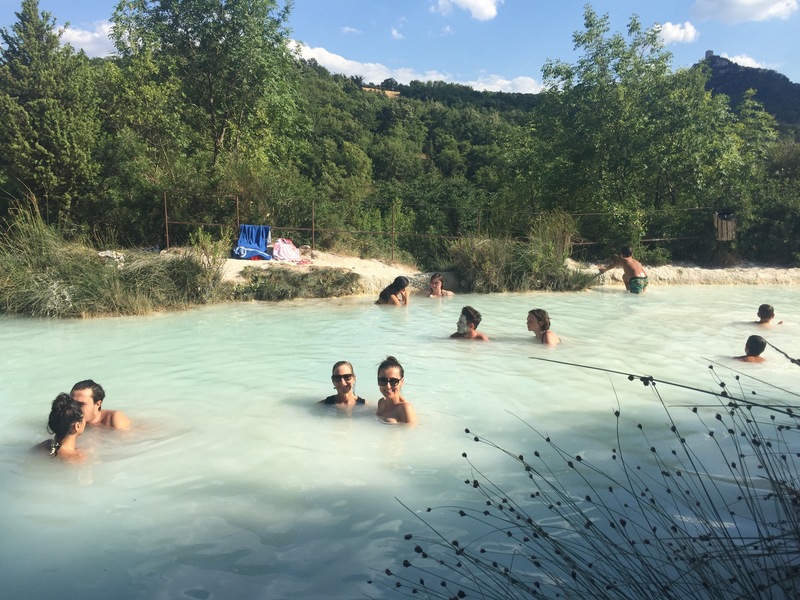 Next we drove five minutes to Bagno Vignoni, the hot springs famous since Roman times. 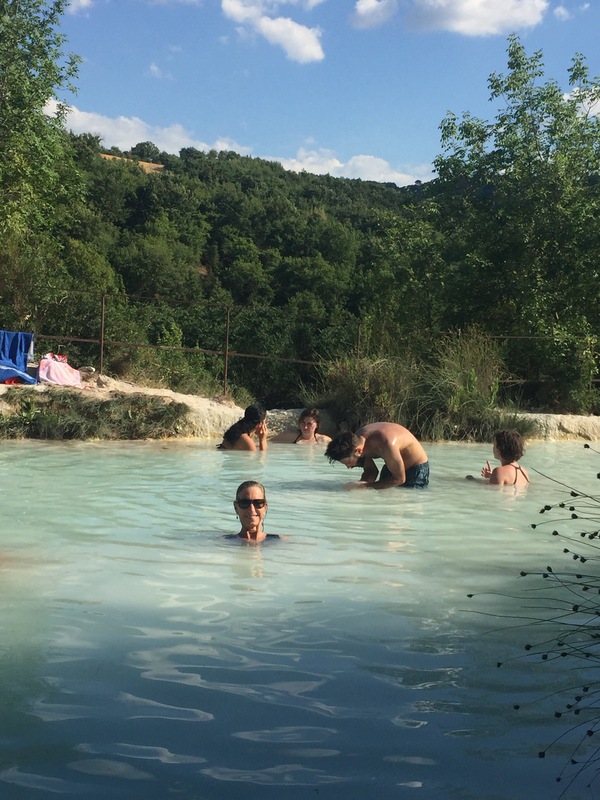 Sara led us down the path to where the water falls over the cliff into a beautiful aquamarine hot spring with white clay. Of course I didn’t wear my suit, but I jumped in anyway, unable to resist. It felt wonderful, and Sara (Czech) brought her suit, and thankfully lent me her towel for afterwards. We walked up to the Roman piazza, and then most of us ordered an Aperol spritz at a cafe. We had a wonderful time. Il Sasso attracts the most wonderful people. 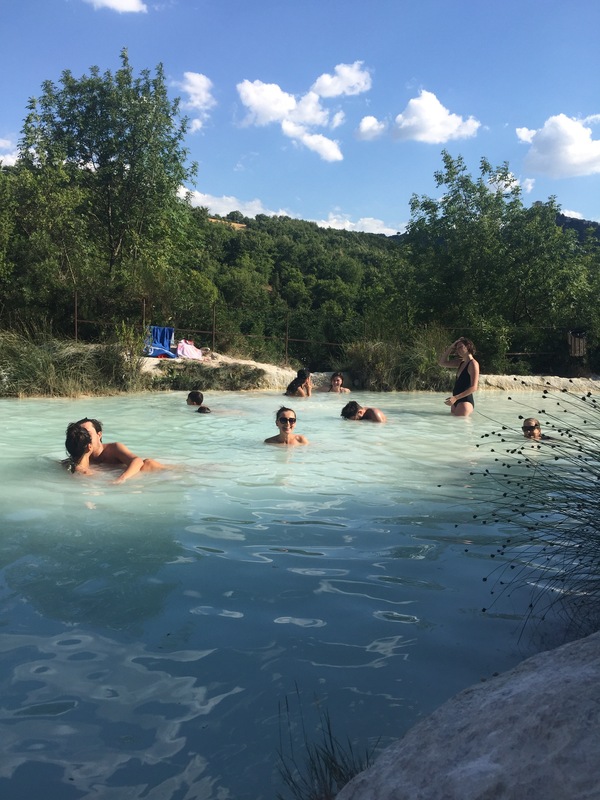 Bagno Vignoni hot springs. On my third visit, I found them! 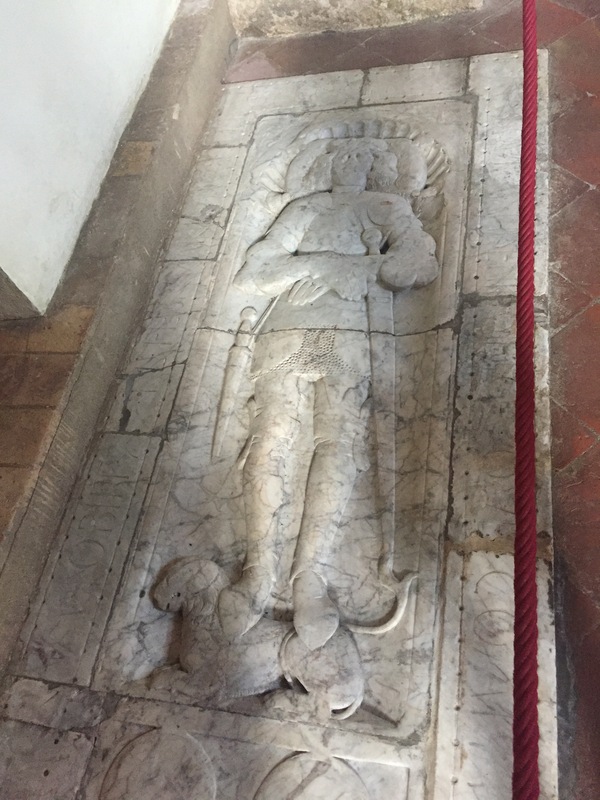 In a small, obscure church, who is this knight? 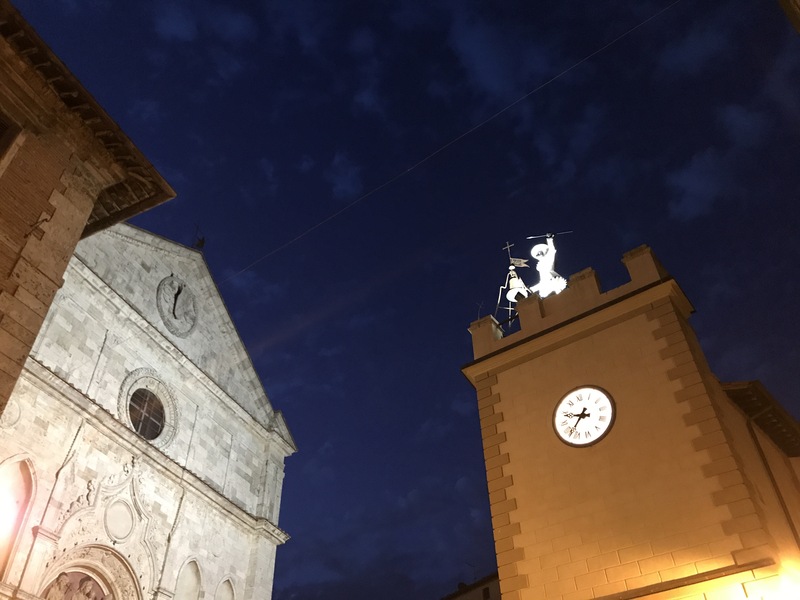 Henrietta took this of Montepulciano at night! 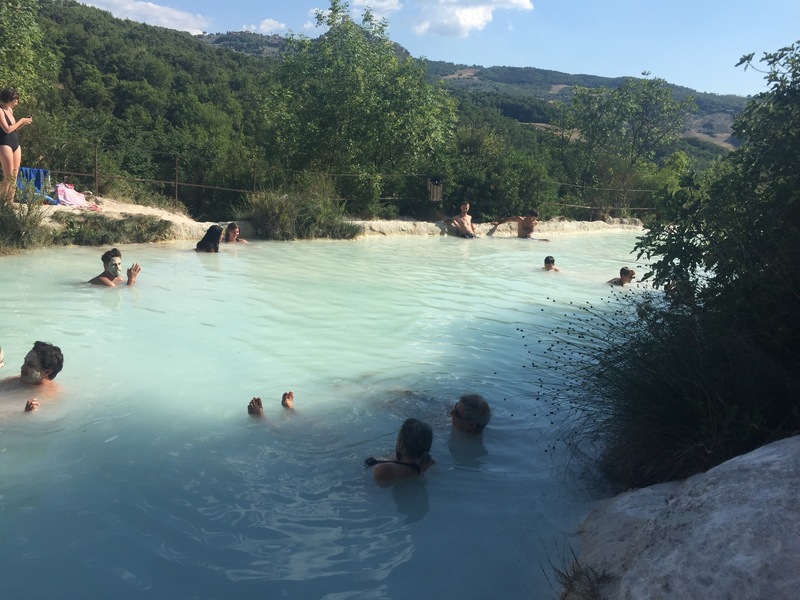 We didn’t make it to the actual baths in Bagno Vignoni either, so it was good to see your photos! And I admire your jumping in sans suit, brava!! 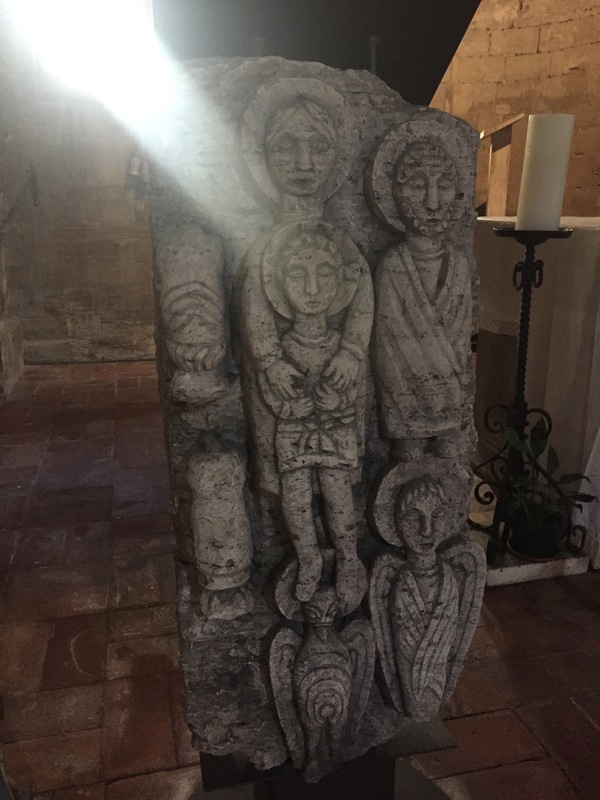 I loved the photo of the stone carving in the San Quirico church with the shaft of light coming through. I’m only disappointed that you didn’t make it back to Trattoria Al Vecchio Forno, but that would have just been too perfect, I guess. 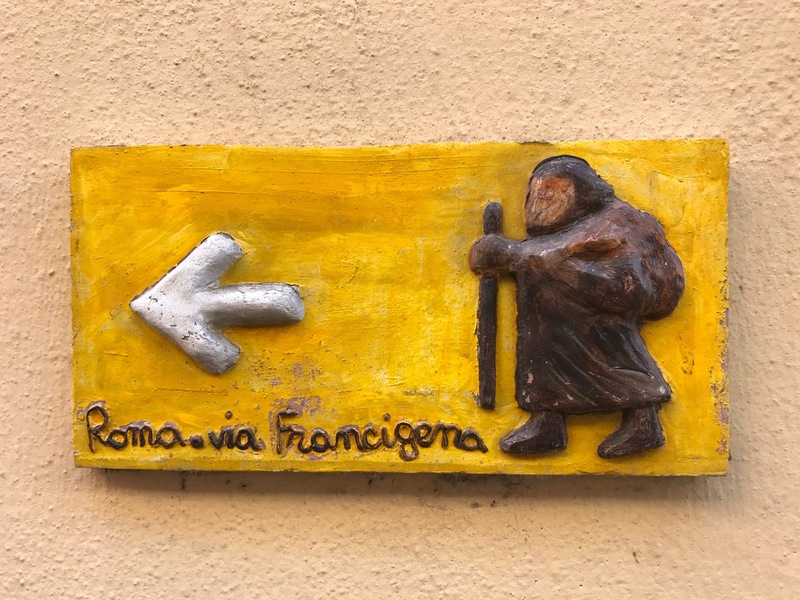 I was able to leave Italy behind gradually with your blog as a transitional object, now I will have to go cold turkey when you leave! Cosi triste! I think this country is making me a little manic. I’m troppa estraversa, if that’s even possible. I have one more post I’ve been working on gradually. I can’t believe I’ve been a Montepulciano per un mese. La insegnante Sara mi consigli maggio per visitare Montepulciano, ma devo fermare il mio lavoro. I’m wearing my Audrey dress again today. Perche no? Once again–incredible photos! 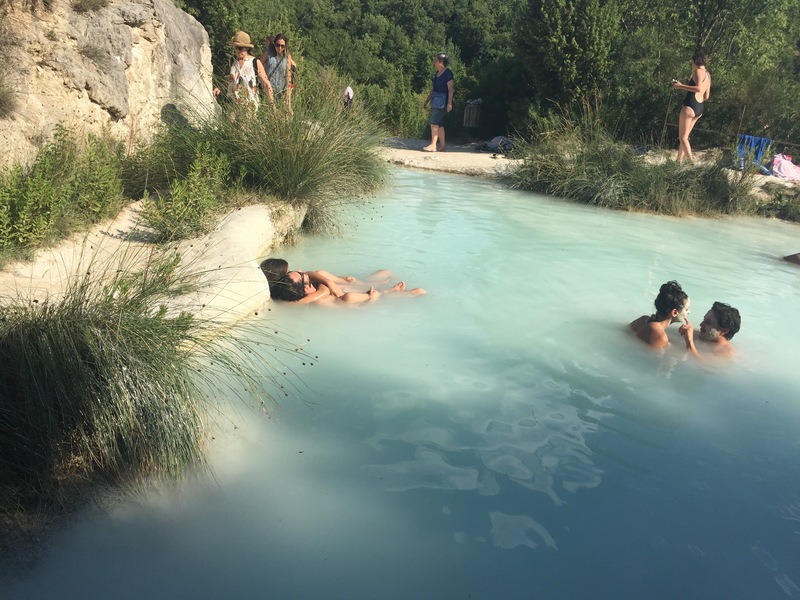 Love the springs–I am so glad you jumped in despite not having your swimsuit–you would have regretted not “testing the waters”. Was the water warm or hot? 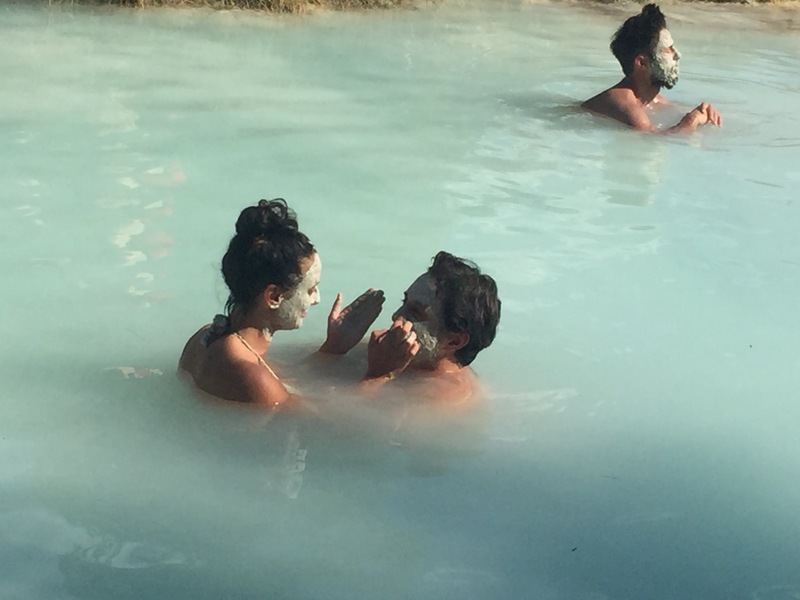 Looked like a very romantic spot……….what was everyone putting on their faces? What a lovely day! You’ve had such amazing adventures with your class, and yes, what a lovely community you have found.